DISCOVER THE MAGIC OF THE DESERT AND ITS INHABITANTS WITH OUR NIGHTLY AND DAILY EXCURSIONS. You will set off on camels for about two hours of an unforgettable experience where you get a chance to appreciate the changing colours of the dunes. The intensity of the sun shines light on the sand dunes, as you experience the silence and the magic of the desert. Our services include excursions on camels through the dunes, as well as a night in an oasis with real nomads. These excursions will give you the opportunity to watch the sunrise and the sunset that come with the rhythm of the traditional music played by the nomads' on their drums. Those animations are what make the reputation of the South of Morocco. The 'Sahara' is synonym of evasion; it offers you with a transformation of scenery as it will drift you away from the active and noisy life of the city. We like to conclude this experience in a few words in which it "offers you its dunes and stars that are crowning the sky"
For the adventurous individuals that want to live experiencing the life of a nomad, we also organise a 3 night trip or more in various places. We offer you the possibility to make a trip for two or more days to travel all over the desert on camels when appropriate (when the temperature decreases) and get a chance to visit the nomad's and their families to allows you to get the opportunity to get to learn their way of life. This is a unique involvement in discovering the desert and their people. www.lomejordemarruecos.com also organises one day excursion. If during your stay, you wish to discover unique places, we are offering you excursions for you to spend a great day. 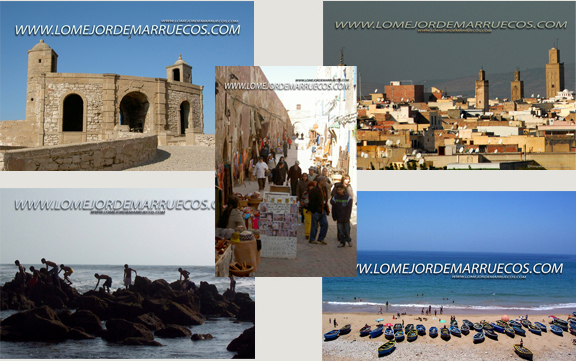 Visit of the Medina of Essaouira with its ancient doors and its beautiful port. Visit of the valley of Ourika travelling all over the river, until its spring in the mountains of the High Atlas. Visit of the Ouzoud falls, the largest of North Africa. Visit of the Kasbah Ait Ben Haddou and Tatouet. Visit of the palm grove of Araa and Zagora by the Kasbah of Tamnougalt. Visit of the Todra Gorge passing through the Dades Valley and the Kasbah of Skoura. Visit of the Dades gorge passing through the valley of Roses and Boutaghar by the cities of roses and by the Kasbah Skoura. villages. Excursion on camels backs and overnight in tent in the heart of the desert. Day 2: Visit of Erfoud, Todra Gorge and the Dades valley on our way back to Ouarzazate.